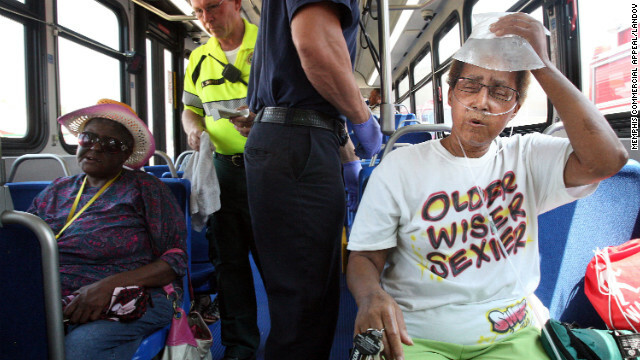 Linda Gordon, right, finds relief from the extreme heat with an ice pack in Memphis, Tennessee, on Saturday, June 30. NEW: New York City will be under a heat advisory from noon to 7 p.m.
(CNN) -- People in a huge swath of the United States are being urged to seek out shelters as needed on Sunday as a historic heat wave continues to bring sizzing temperatures -- including to some who have lost power. Extreme heat is the leading cause of weather-related deaths in the United States. Twenty states were either partially or entirely under excessive heat warnings or heat advisories on Sunday, according to the National Weather Service. 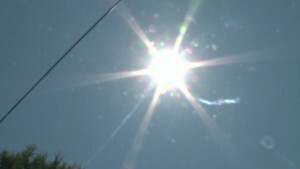 Temperatures over 100 degrees Fahrenheit were expected in much of the Southeast. New York City was among the sites in the Northeast facing heat advisories. The National Weather Service said the advisory would be in effect from noon until 7 p.m. ET for the city, with temperatures expected in the mid-90s. When combined with humidity, it could feel like 100 degrees. Over the past week, nearly 1600 high temperatures have been broken -- including 140 all-time highs, according to the National Climatic Data Center. Statistics for Saturday, when more records were broken, were not yet available. 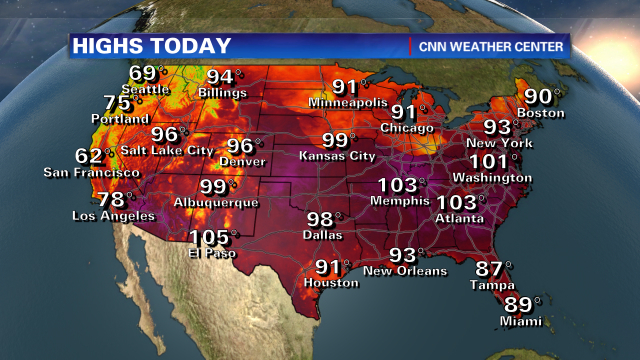 Temps soar across the U.S.
Will 2012 be the hottest summer on record? Meanwhile, a derecho -- or massive storm -- that moved across the Ohio Valley to the Northeast on Friday left 12 people dead and millions without electricity. Many remained without power on Sunday. 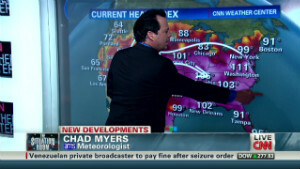 Some residents in the affected areas, particularly between Chicago and Washington, were likely to see high temperatures in the 90s or even 100 on Sunday, said CNN Meterologist Sarah Dillingham. "Even with areas seeing temperatures in the 80s to low 90s, no air conditioning will still pose a major threat." "Residents who have no air conditioning are urged to find local cooling shelters or other air conditioned establishments to keep cool. It is imperative people do anything they can to try and beat the heat." Cities throughout the affected regions opened cooling shelters and sites offering water. "I'm very concerned with the problems created by the combination of power outages and severe heat," said Ohio Gov. John Kasich, who said it could take up to a week to get the power back up to everybody in the state. Kasich also called out the Ohio National Guard to check on and help the state's most vulnerable, primarily the elderly and the ill. While crews worked around the clock to restore power, hundreds of thousands of customers remained without electricity on Sunday. FirstEnergy said four of its utility companies combined still had well over 300,000 customers without power Saturday night. AEP Ohio said it had more than 500,000 customers without power Saturday night. BGE said Sunday morning it had more than 300,000 customers in Maryland still without power. The deaths from Friday's storm stretched from Ohio to New Jersey. 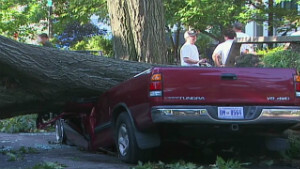 Most were the result of downed trees and power lines, according to officials. The destruction prompted state of emergency declarations by governors of Maryland, Ohio, West Virginia and Virginia. "This is not a one-day situation; it is a multiday challenge," said Virginia Gov. Bob McDonnell, who called it the largest power outage unrelated to a hurricane in the state's history. In West Virginia, power outages forced the closure of a large number of gas stations after pumps were rendered inoperable. Brian Duckworth waited in line for gas for nearly two hours in Vienna, along the West-Virginia-Ohio border. "I wouldn't even be here because I have plenty of gas in my truck," Duckworth told CNN affiliate WTAP. "But I have to get gas for my generators and some backup gas." 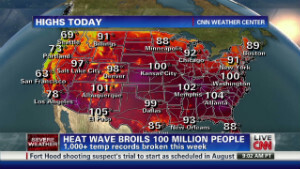 Triple digit highs scorch the U.S. The storm also affected Amtrak service, including shutting down service between Washington and Philadelphia on Saturday. Those most inconvenienced were aboard a train that ended up grinding to a halt Friday night in Prince, West Virginia, after trees blocked tracks both in front of and behind it, Amtrak spokesman Steve Kulm said. By late Saturday night, the 232 passengers -- who stayed aboard the Chicago-bound train, which had air conditioning and food -- had been taken off and put on buses so they could reach their final destinations, according to Kulm. The storm's deaths included six in Virginia and two children in New Jersey, cousins who huddled with their families in a tent in Parvin State Park when strong winds felled a pine tree, crushing them. Their relatives all survived relatively unscathed, said Larry Ragonese, a spokesman for New Jersey's Department of Environmental Protection. In Washington, a couple was electrocuted after they went outside to check on downed power lines. The husband was killed while the wife -- who is in critical condition at a local hospital with burns -- is expected to survive, said police spokesman Araz Alali. Photos: Storm damage in Washington, D.C. Emergency rooms in Prince George's County, Maryland, filled up over the weekend by people looking to escape the heat, said Fran Phillips, deputy secretary for the state's Department of Health and Mental Hygiene. She noted that libraries and community centers across the state would stay open late to act as cooling centers. Even in places where power was not disrupted, people with no air conditioning were advised to spend the day in a library, a cooling center or some other such place to avoid heat exhaustion. In Atlanta, where temperatures hit a record-breaking 106 degrees on Saturday and were projected to hit 103 degrees on Sunday, cooling centers were ordered open across the city. CNN's Josh Levs, Chelsea Carter, Moni Basu, and Greg Botelho contributed to this report.